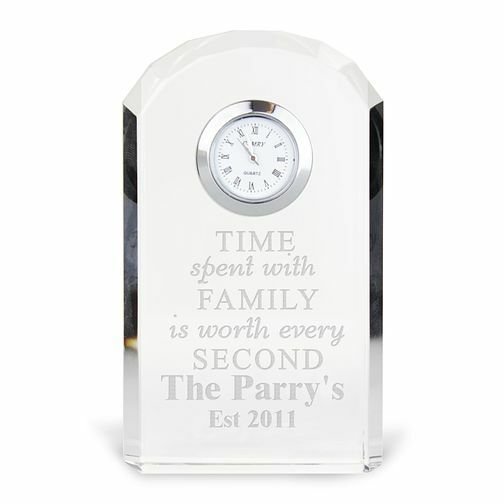 This stunning Engraved "Time Spent With Family" Crystal Clock will make an excellent addition to your lounge. This item can be specially engraved with a family name and is ideal as a birthday, retirement or anniversary gift. Engraved "Time Spent With Family" Crystal Clock is rated 4.0 out of 5 by 1. Rated 4 out of 5 by Anonymous from Product good and great concept Product good, HOWEVER had 2 scratches on it. Didn’t complain as this was a birthday present but as I paid extra for express delivery. I will be thinking twice about ordering from H Samuel again.